The Directorate General of Civil Aviation (DGCA) has asked SpiceJet to immediately discontinue it’s offer of selling air-tickets at Re 1. DGCA has termed this offer as malpractice. 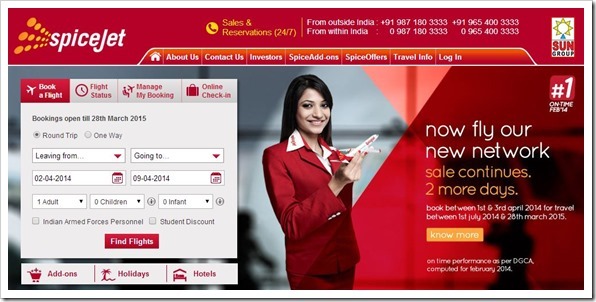 Yesterday, SpiceJet spiced up the domestic airfares by announcing special tickets priced just at Re 1. The offer was valid only for three days, and was meant for travel post July 1, 2014. The fare of Re 1 was excluding any taxes. Besides this offer, SpiceJet had also announced special fares at Rs 799 and Rs 1499. Hours after this special offer was announced, DGCA shot down a strongly worded letter, terming this offer as ‘malpractice’ and ‘predatory’ and asked them to stop it immediately. Official sources said that the offer violated Rule 135 of the Aircraft Rules relating to air tariff. SpiceJet had infact only reserved 1.7% of its daily capacity under this special Re 1 offer, which was filled up yesterday itself. 1.7% means 2 seats per flight it operates on a daily basis. They justified this special pricing by saying that they would have covered up the loss by cheap ticket by other means and this offer would thereby add to the airline’s ancillary revenue. This is for the first time that DGCA has officially asked an airline to discontinue such special scheme. In the past, DGCA had only raised concern over such low cost pricing models to lure customers but didn’t take any action. This immediate suspension of special ticketing plan will surely set an example for other airlines as well. But the consumers will lose discounted air tickets. In the past 6 months, this was 5th such offer by SpiceJet (see some of the earlier offers here and here). In the shareholder’s report filed for last quarter ending in December, SpiceJet had posted a loss of Rs 171 crore. Fare related war among airlines was initially started by Air Deccan when they literally slashed away the prices and ignited a new wave of air fares. But the model couldn’t sustain as due to heavy losses, they had to sell out to KingFisher Airlines, which has itself folded up. Smartphone Screen Size Increments – Is it Time To Stop? What will happen to customers like me who have already booked the tickets?